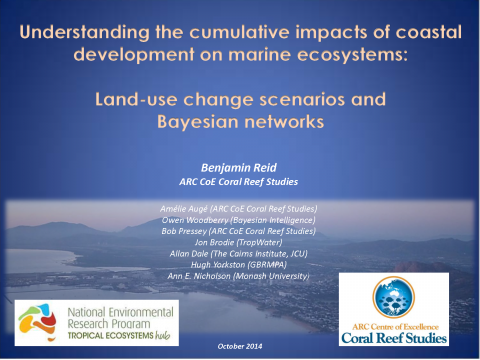 Ben Reid (JCU), Amélie Augé, Owen Woodberry, Bob Pressey, Jon Brodie, Allan Dale, Hugh Yorkston, Ann E. Nicholson; Understanding the cumulative impacts of coastal development on marine ecosystems: Land-use change scenarios and Bayesian networks; Wednesday 5th November. Devlin, M., Fabricius, K., Negri, A., Brodie, J., Waterhouse, J., Uthicke, S., Collier, C., Pressey, B., Augé, A., Reid, B., Woodberry, O., Zhao, J-x., Clarke, T., Pandolfi, J., Bennett, J. 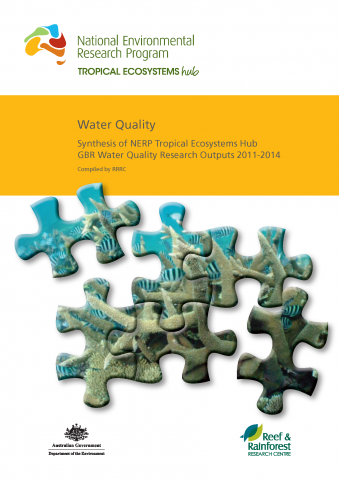 (2015) Water Quality - Synthesis of NERP Tropical Ecosystems Hub Water Quality Research Outputs 2011-2014. • Risk-based assessment of the long-term outlook for the Region. • Members of regional communities and the public. 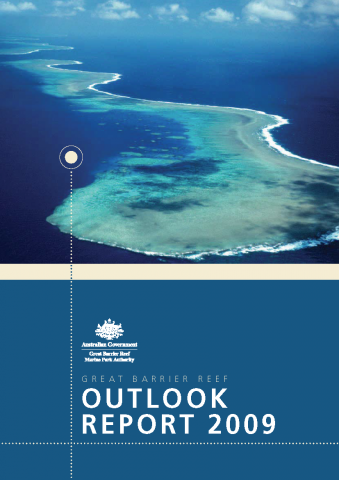 The publication of an Outlook Report was a key recommendation of the review of the Great Barrier Reef Marine Park Act 1975. 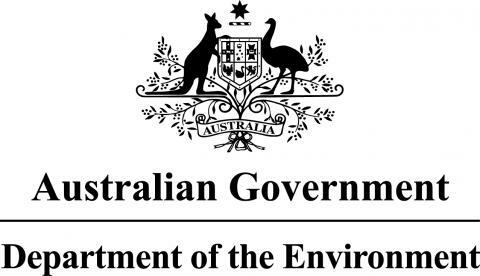 A report is to be prepared every five years and given to the Minister for Sustainability, Environment, Water, Population and Communities for tabling in both houses of the Australian Parliament. 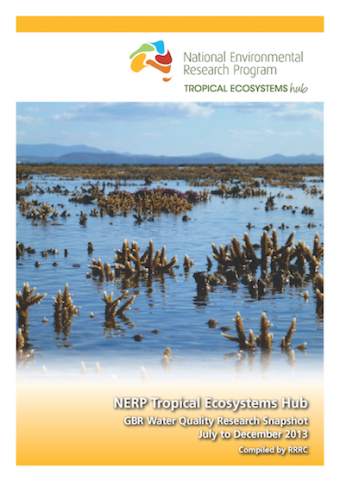 The Great Barrier Reef Outlook Report 2009 is the first of these reports. 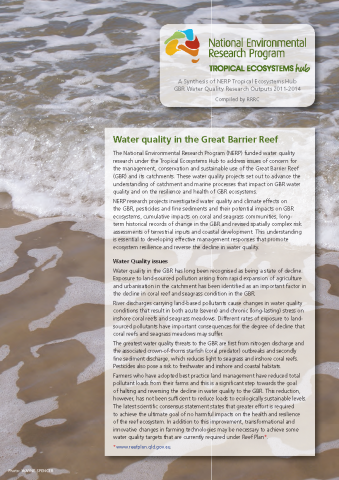 A snapshot of the research progress within the Great Barrier Reef Water Quality node for January to June 2013. 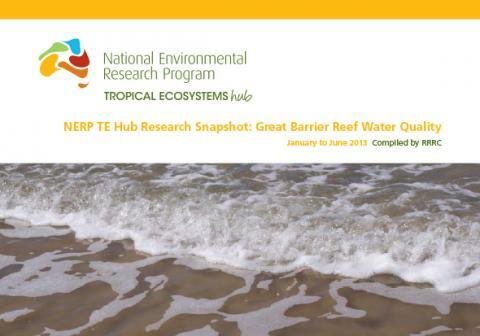 A snapshot of the research progress within the Great Barrier Reef Water Quality node for July to December 2013. Dale, A.P., Pressey, B., Adams, V.M., Álvarez- Romero, J.G., Digby, M., Dobbs, R., Douglas, M., Augé, A.A., Maughan, M., Childs, J., Hinchley, D., Landcaster, I., Perdrisat, Ian., Gobius, N. (2014) Catchment-Scale Governance in Northern Australia: A Preliminary Evaluation. 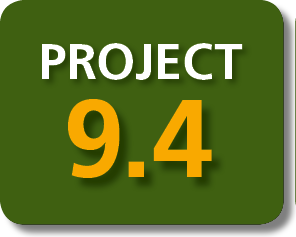 Journal of Economic and Social Policy. 16 (1). Bos, M., Pressey, R.L., Stoeckly, N. (2014) Effective marine offsets for the Great Barrier Reef World Heritage Area. ScienceDirect. 42, 1-15 [doi: 10.1016/j.envsci.2014.05.002]. 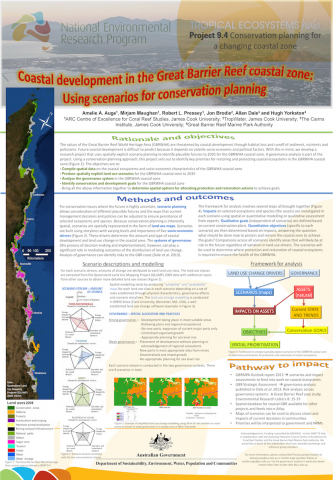 Coastal development in the Great Barrier Reef coastal zone: Using scenarios for conservation planning. 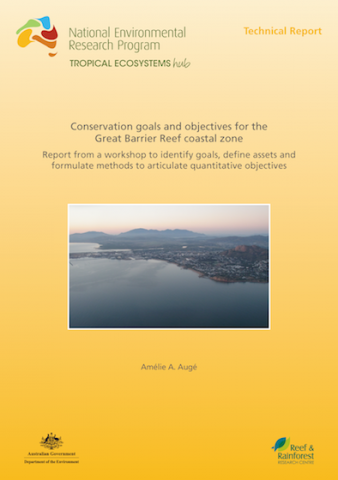 Augé, A.A. (2013) Conservation goals and objectives for the Great Barrier Reef coastal zone Report from a workshop to identify goals, define assets and formulate methods to articulate quantitative objectives.